I think now will be the best time to transplant. They will, definitely, shed leaves into your pool. I think a few things are happening here. It seems to be, mostly, frost damage, but magnesium deficiency seems likely as well! I would recommend dolomitic lime, and wettable sulfur. These will help supplement magnesium, calcium, sulfur, carbon, and oxygen back into the soil. It will also kill off any infection that could be starting. You can go ahead and cut off any dead fronds, but leave the living growth alone. Thanks for the info. How often should I apply the lime and sulfur? 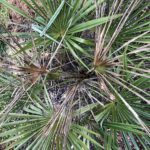 What type of fertilizer do I use for the windmill Palm near Atlanta and when to apply?